Encourage healthy habits with this adorable CHARM IT! Red Apple charm. Complete with sweet cheeks of sparkly green stone, this cute Red Apple charm adds 3-dimensional fun and personality to your CHARM IT! girl's charm bracelets and jewelry. With a simple snap of a clasp, girls can personalize their CHARM IT! jewelry with this CHARM IT! 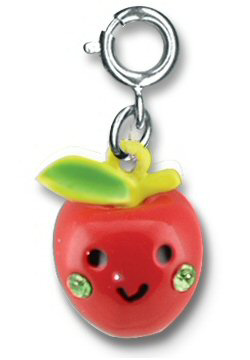 Red Apple charm.